10 Junket has been added to your favorites! 10 Junket has been removed from your favorites! HILTON HEAD ISLAND. Imagine your ideal vacation beach home—you’ve arrived at 10 Junket. 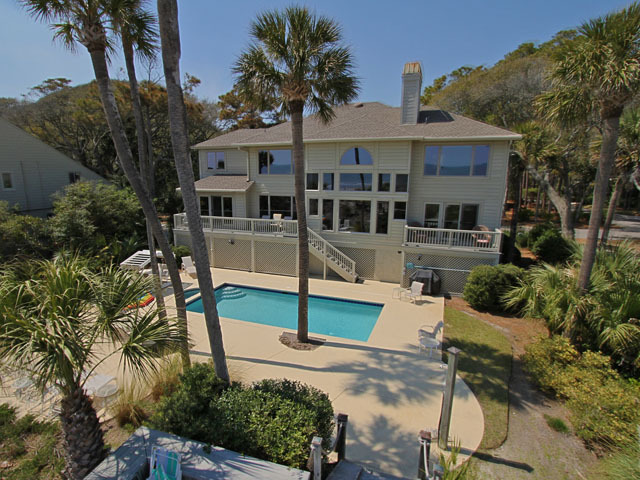 This is the finest guest mansion on Hilton Head. The oversized antebellum styled front porch will remind you of Tara in Gone With the Wind. Perfect for extra large groups, it boasts eight bedrooms, all with private full baths. There are two additional full bathrooms making it a one-of-a-kind eight bedroom, ten bathroom ocean front dream home. All the bedrooms and living rooms have Vizio Flat Screen 3D High Definition TVs ranging in size from 42 inches up to 55 inches- a total of 11 super large top-of-the-line flat screens. There are also 5 Blue Ray and or DVD players. Some of the Blue Rays are 3D ready. A DVD/ Blue Ray collection is on hand for viewing at no extra charge. The elevator goes to all three floors. Local and long distance domestic phone calls are free. Some spots in Palmetto Dunes have poor cell phone reception, so this home has been equipped with a cell phone signal booster to enhance coverage. Enjoy free wireless internet service throughout the home; there are three Wi-Fi signal boosters. Main Floor: Take in the breathtaking panoramic views from almost every living space. The front steps and oversized porch is made of Old Savannah bricks. On this main level is the gourmet kitchen, which is complete with high quality stainless steel appliances, including double ovens, two new dishwashers, microwave, coffee makers, blenders, and a wrap around granite bar that seats nine. The pantry also has a refrigerator/ freezer for extra large groups. The kitchen opens to a formal dining space which seats ten. Enjoy beautiful views from the dining room which overlooks the pool and ocean and feels extra roomy with picture windows and twenty foot high ceilings. The den has a cozy feel with a gas fireplace and a teakwood porch overlooking the pool and ocean. The living room has a big screen TV, wet bar, ice maker, full bath, and private teakwood porch overlooking the pool and ocean. In addition to the side-by-side refrigerator/ freezer in the kitchen, another side-by-side refrigerator/ freezer is located in the pantry. A large stereo system is connected to the TV/ DVD with speaker zones in the living room, kitchen, and formal room. Bedroom #8 on this main floor has a king sized bed, bedroom #7 has two matching queen beds, and bedroom # 6 has matching queen beds. They all have private baths. Top Floor: Look out over the pool to the ocean from this floor and take a deep breath. The views are incredible. The Great Room has a wine cooler, TV, and a computer center complete with a fax, scanner, and color printer. The computer is a IMac all-in-one. Two extra ink cartridges are on-hand at no extra charge. Connected to the TV/ DVD is a stereo system with plenty of speakers. Bedroom #1 has a king sized bed, bedroom #2 has a king sized bed, bedroom #3 has a king sized bed, bedroom #4 has two queen sized beds, and bedroom #5 has a king sized bed. The living area has a sleeper sofa. All bedrooms have private full baths. Coffee makers are located in two of the master bedrooms. Three of the bedrooms have private teakwood porches to enjoy the views, the breeze, and the soothing sound of the waves as they crash on the pristine sugar white sands. Ground Floor: We call this the party area. Enjoy gatherings at the teakwood bar and covered deck. The bar seats nine guests. Gas BBQ grills and two under-the-counter refrigerators are just a couple of the amenities. Extra propane gas tanks are on hand at no extra charge. There are two large seating areas with Martha Stewart furnishings on either side of the bar. The bar overlooks the pool and ocean. There is a fold-up ping pong table in the bar area. The pool and spa are heated upon request for an additional fee of $700 per week. Enjoy ping pong or just lounging on one of the dozen or so lounge chairs. A full bath and an extra exterior shower are also conveniently located on this ground floor. Tucked away for privacy is a stylish billiards room with an extra refrigerator. There is a drop freezer on the ground floor. 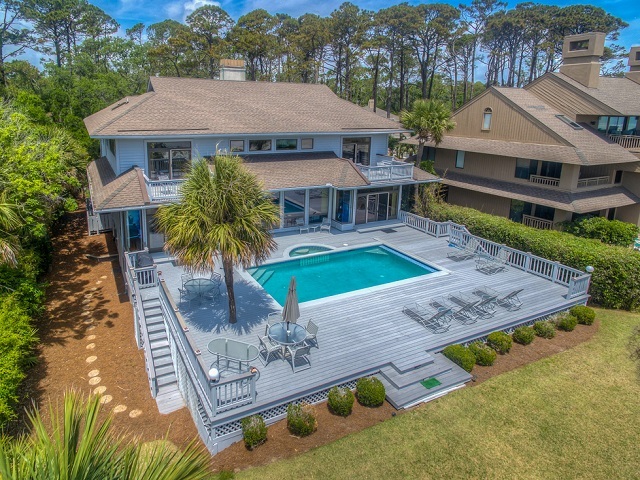 No detail has been spared in this amazing VIP Hilton Head Island Home. 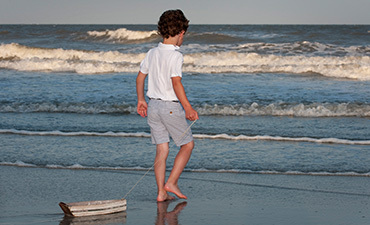 Atlantic Ocean/ Beach: The pure white sands of Hilton Head’s most exclusive beach are literally steps away from the pool deck. A beautiful sunset beach stroll or just relaxing in the sun is only moments away. The Atlantic Ocean is right at your back door and the time is always right to feel the sand between your toes. Come and create memories that will stay with you for a lifetime at the vacation home of your dreams.